Liz, I approved your comment. I assume you were testing the twitter embed feature? 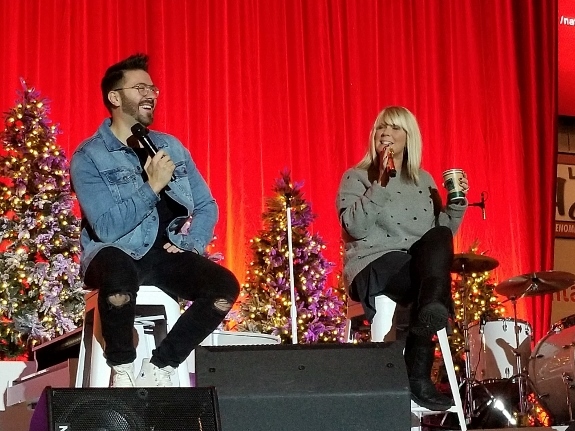 I hope everyone that is attending Danny and Natalie’s Christmas Tour will comment here about it. 🙂 The Prayer is so beautiful. Was wondering if it could be nominated for any awards in the future.. I can put it back or keep it this way, let me know what you all like. l can get used to grey screen.Its easy to look at. I don’t like the gray screen. But I do like the snow! My screen is still white. The writing is still black. Snow is blue. The comment box, where I am writing before I post, has a dark screen–almost black. The writing there is white. The feature I had for the snow effect the past year or two isn’t there anymore, but I found a new one that let’s us tailor the colors. We’ll have to see if it stays blue 🙂 It seemed like the right choice last night, it’s been unusually cold where I am. Brrr. We had the real stuff in Wisconsin today! Just check out Danny’s insta-stories to see how excited he was to be back in WI and have snow! I will be sharing my trip to see the Christmas show on Saturday night. You probably have noticed my tweets about it from the DGNews twitter and Instagram account. I also have some short videos, etc. And maybe a tidbit from Danny himself…. no time with Santa Ed and Danny this time– when he is on this tour with Natalie, they really do try to limit their exposure and rest their voices. Let me know if this GIF gives you a headache! I can replace it with a single photo. Look at the height of Danny’s hair…. I feel like the grinch who stole Christmas, but yes, Jan, the gif really does give me a literal headache. I am not fully recovered from my car accident, and one of the things that hasn’t budged is my sensitivity to sound and light (which includes fast action as well as flashes of light). I will swap it out when I get a chance, Ellen. I read that Toby Keith spoke with Clint Eastwood at a charity golf tournament, and discussed Clint Eastwood’s upcoming 88th birthday. Toby asked Clint what keeps him going. He replied, “I just don’t let the old man in!” And, that became his new song.. Thanks for the video, Admin2. And that sounds like good advice, Cindy. Unfortunately, my degenerative joints in my hands and feet frequently remind me that an old person is trying to get in…. Today I had to hand the manual cookie press to my daughter when we were making Christmas Spritz cookies. I think the song is pretty, but…I had to take early retirement (because of health problems) and quit driving long before I expected. It does seem like good advice if one can manage it. All of you are so young. I do love this snow, Admin 2. Nice to see some DG news. I found it interesting to listen to Mark L. talking about MDYK and his thoughts on what she might have ‘known.’ I read a blog earlier this week about the song that was discussing the lyrics. He had better answers than the blog-writer was giving him credit for. This can be such a tricky area for songwriters and performers sometimes, thinking about this example, or the recent mini-kerfluffle that Lauren Daigle got into. I found Mark’s talking about his thoughts on his song interesting, too. I had to go back looking for the early video of Danny singing the song, before it became more polished and eventually recorded. I think this was the first one? Still is powerful. Very well suited to his voice, among other attributes of course. He copied it to his youTube channel and shared it. I managed to post something, all by myself for a change. Danny will be part of a group of artists celebrating a very well-known Christian music performer in April. I wonder if it might be recorded for television somehow. You know, working fulltime is definitely cutting into my ability to scoop Danny on his news. I saw the article and video about it last night. But I was too tired last night and too busy at work today. But, I did put up a nice post on it. How awesome! TBN will be broadcasting TBN at three different times! That is great news about the televised concert, I hope a lot of people see it. That’s great news! I can’t wait to watch. I haven’t got her newest music, but The Blade was great. I also like her earlier songs like this one – I saw it on CMT or GAC video channels, first time I’d been aware of her but I really liked it. Cindy3, I tried that and it worked for me! I’ve been meaning to post about Danny and Christmas music. Of course, the Sony-era version of “O Holy Night” by Danny is a classic in my eyes. Ditto almost any version of “Mary, Did You Know?” by Danny. I’ve heard both songs done by others artists, but rarely if ever better. Those are my two favorites. This deserves to be heard every year at Christmastime. I only hope I can get the video to display, and not just the link. Admin2, I am very grateful to Danny for introducing me to country music. I thought I hated it. I remember a time when I thought than Danny’s former labelmate, Chris Young, sounded too twangy. LoL, little did I know! I am so glad I bought the Kohl’s Cares CD, which has the Sony version of “O Holy Night” on it! For those who chose to read it, here is a harrowing account of the Camp Fire that burned Paradise, California. It is not easy reading. But it will make you think of many things, including whether your community has sufficient routes of egress to get people out of the path of fast-moving disasters such as wildfires, volcanic eruptions and their immediate sequelae (pyroclastic flows, lahars, etc), flash floods, and so forth. OK, the 12:06 a.m. post was supposed to say “NEVER got any traction at country radio.” Even with the edit feature, I still make mistakes! Did you like this version of Masterpiece better than Danny’s, Admin2? The instrumental version is very pretty, IMO. Yes, “Andrew Gorkey” is a odd combo of their names…. editor asleep? “The Prayer” is moving up nicely (and should be also at Billboard after this week’s slump) on Mediabase. My heart goes out to the people of Paradise, and all who have experienced such devastation. We have three ways off this mountain. Some dirt roads that are hard to travel. Worse case… we’d all head for the large lake. 🙁 Earthquakes are another matter. We always keep plenty of food and water in the house. Err, yes, I did, Jan. I’m sure you aren’t surprised 🙂 It works as a guitar piece. Harrowing account of the Camp Fire, Ellen. And to think that the man that risked his life to save his house now has a house that no one will want in a town destroyed by fire…. A dear friend of mine is from Paradise. Through the years I had talked about joining her when she went back for a visit. Both of her parents passed away a few years ago and she no longer had that tie to Paradise. Now everything she remembers from her past in that town is gone. I should have added tsunamis to my list. You can’t outrun an earthquake, and shouldn’t try. But the tsunami that follows, if you live in a low-lying area near a body of water like an ocean, can be predicted and will follow within a certain time frame, depending on the location of the earthquake vis-à-vis the vulnerable area. Oregon is finally paying attention. The Cascadian Subduction Zone earthquake of 1700 is estimated to have been a 9.0. The tsunami that followed wiped out Native American villages along the coast. One current community on the Oregon Coast moved its elementary school after determining that students could not get to high ground within the likely window of time before a tsunami hit. But for other communities, there is no high ground. Also, evacuation by car isn’t feasible in most cases. It’s essentially run for the hills! Or walk quickly! In either case, that is difficult for the mobility-impaired to do. Jan, I am so sorry about your friend with ties to Paradise. Small consolation, but at least her parents did not have to go through the wildfire. I remember hearing “Lift Up Your Eyes” on the radio last year. It is an original Christmas song co-written by Danny, but it sounds like a classic to me. That is hard to do. There are so many traditional carols, religious Christmas songs, and secular Christmas songs out there, competing for attention. One thing (among many!) that I don’t like is how radio plays Christmas music too early, then stops the day after Christmas. ☹️ 😧 😬 👿 Does Christian radio do this as well? Advent is not the Christmas season! The season commences on Christmas (or Christmas Eve, in my book) and continues at least through the Twelve Days of Christmas, January 6th, the Feast of the Epiphany. Christian Airplay Greatest Gainer! #16 (lw 36) A jump of 20 spots!!! Its marked as “Award” for being the charts greatest gainer. Yes, it was for The Prayer, Ellen. I fixed my post. Glad to see The Prayer charting. Since it’s not purely a Christmas song, perhaps it can continue to run on the charts past Christmas week more than some more seasonal releases. Oh, but I love the blue snowflakes! The color of the ice on the top of a glacier (though I have forgotten why that is so). Danny is very busy. I had such a nice time at his concert this fall. Hope he comes back our way, soon. Although I do think the blue snowflakes are prettiest, I am not the only person who visits this site, Admin2, so if you want to change the color of the snow, please do so. I do have one request, though: please do not turn off the snow immediately after Christmas, but let it run at least through the Twelve Days of Christmas, if possible. Many thanks for all that you and Jan do! Posters wrote about pink snow. I thought mine was a light purple. Then they wrote about blue snow. Mine was green. My color snow now appears black. I like all my colors. I’ve written before that I have black writing on a white background. I believe that changed for some of you. So nice to see Danny on my television. Such a beautiful program. He sounds great. Via Danny’s Instagram account, he reports he is shooting his music video for Just Haven’t Seen It Yet! So surprised he is THIS busy at this time of year. He also said he is going home for Christmas this year. Good for him!